Who Does She Think Will Pay? An Obama fan, clearly mesmerized and ecstatic at being in front of ‘The One,” reveals her thoughts. Where do Obama fans get the idea they will no longer have to pay for what the rest of us do? Obama: Wanting to Keep What You Earn "Selfish." Government is "Charity." Then Obama claims that he can reduce the taxes of 95% of the people. As you can see from this chart from the Wall Street Journal, the bottom 50% of earners pay barely ANY income tax. Approximately 40% of earners pay no income taxes whatsoever. What Obama proposes is that we Spread the Wealth Around, give money known as “refundable tax credits”–to people who don’t pay taxes. While he stammers around deciding which group of “rich” people he’ll hammer with increased taxes (is it above $350K? $250K? $200K? $150K? Dunno, he’s said all 4), you can see by the chart there ain’t no way 95% are going to get a tax cut. No. Way. Especially since he favors allowing the Bush tax cuts to expire–an immediate TAX INCREASE! See next chart from the Wall Street Journal. But that’s not even the most disingenuous part of his schtick. Obama blames the current economic emergency on the republicans. This is laughable. Of course democrats want to blame Bush for everything. This exploded on his watch. The only thing Bush did w rong was not fight harder for the fix for Fannie and Freddie in 2003 and when McCain wanted to put the brakes on Fannie and Freddie mortgages in 2005. Bush’s response has been to get government even more involved which I think is a mistake. But this disaster has its roots in democrat plans to make sure everyone can buy a house and made worse over the years by groups such as A.C.O.R.N. Making it easier for poorer people to attain more wealth through home ownership is a laudable idea, but the way this was done was foolish. We know that all too well now. See this piece here about how TOO MUCH regulation (through redistributionist programs such as CRA) and so called “SMART GROWTH POLICIES” here helped create and worsen respectively this disaster. Portland and Seattle are you listening? Add money supply issues and you’ve got a problem which has left the WORLD teetering on recession. I repeat, when the democrats were forewarned they fought the fix to avert this disaster. This is their Katrina. The world teeters on recession because of their recalcitrance and political correctness. Even Henry Waxman grudgingly agrees that democrats might have had something to do with it. For Waxman that’s as good as a signed confession. He won’t be happy I suppose until we’re in a socialist’s paradise. You first, Mr. Obama. 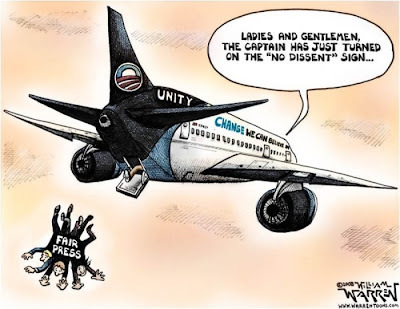 “The Washington Times, which has covered the Barack Obama campaign from the start, was kicked off the Democrat’s campaign plane for the final 72 hours of the race. Even CBS News is beginning to see through the charade of the false messiah. Displaying more of the double standard prevelant in this coup, 2 were arrested for erecting an effigy of Barack Obama on campus at the University of Kentucky. Previous effigies of Sarah Palin are considered “art” by many, but effigies of Obama have brought disciplinary measures in both cases so far. The 2, even though they expressed remorse for “a stunt that had gotten out of hand,” were charged with Disorderly Conduct for the effigy and additional charges of burglary and theft for breaking into a fraternity house where Police believe the materials came from. Will Obama or his handlers cry “racism” every time he is opposed, should he win the coup? FOREWARNING! The article is written and hosted on a site founded by an Iranian ex-Muslim residing in Canada, going by the pseudonym of “Ali Sina” who is often critical of Islam. The lenghty article seems less about Islam and more about Obama, though. Our enemies don’t want him elected. Here.